My Tau battlesuits were amazing last night. Tau battlesuits seem to be a much better investment than Tau Stealthsuits and last night's game against the Tyranids really pressed that home when I ended up with a clear comparison between the two units. Because this was a 1,000pts game, I couldn't splash out on the usual Plasma Rifle / Missile Pod combination Tau Battlesuits, so I took Missile Pod and Burst Cannon instead combo instead. Obviously, it wasn't quite so effective as the Plasma Rifles when gunning down the Carnifex, but against the horde of little gribblies (and that accursed Lictor hiding in the woods with a 2+ cover save) the Burst Cannons were invaluable. By comparison, the 6 Stealthsuits didn't do so well. They were still highly effective, but lacked the strength to deal with tougher targets and as they took up a larger space on the board, they were more vulnerable to blast weapons and fast assaulting units as well. 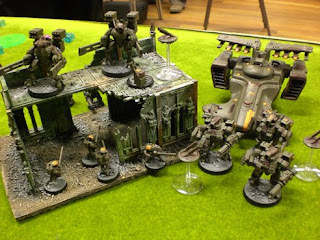 So after the game (which took quite a while because we were chatting about all sorts and admiring each other's painted models) we stood round with a few other people and commented on the events that had unfolded as well as the performance and value for points of the various units. While the Tyranid army had offered minimal resistance and been shot en masse instead, I had still lost the game due to my inability to claim objectives. I had started by placing most of my infantry units in the building that dominated the centre of my deployment zone. This was to counter the dreaded Genestealer-Lictor-Genestealer tactic most Tyranid players seem to employ nowadays. The 2 Genestealer units Outflank and move on from the sides (with rerolls thanks to the Lictor) while the Lictor appears in the centre of the enemy deployment zone. The enemy are then caught between these units and close combat ensues in some form or other. But not today! By filling the available space with infantry, there was nowhere for the Lictor to go. So I quite happily defended that single terrain feature, which I'd also placed an objective on in our game of Seize Ground. On Turn 5 most of the Tyranid army was destroyed. There was a Carnifex in the centre of the table (an immediate threat to my defence and my objective), 2 units of spinegaunts in the far right of the Tyranid deployment zone, claiming an objective, 1 unit of Outflanking Genestealers (reduced to 3 models) on another objective in the right of my deployment zone and a 2nd unit of Outflanking Genestealers on my left. Had the game ended then, I would have lost on objectives, but I got another turn. I had to kill the Carnifex in the centre, which took all the firepower I could muster from the Tau Battlesuits and Sky Ray (hooray for markerlights!). Meanwhile the Skyray and Broadsides wiped out the Genestealers on the left flank with their combined Smart Missile Systems. It was up to the Stealth Suits to kill the Genestealers on my right, because then, if the game ended, it would be a draw on objectives and a big win to me on kills. Well, I killed all but 1 Genestealer. And the game ended. I need more troops to claim objectives. But then, if I lose any of my Elite units I'll simply be overrun. My opponent was keen to count up the Kill Points (if Kill Points had been an objective) and pointed out that I would have beaten him 7 to 1. At least the Tau work well in Annihilation and Capture & Control, because you can go kill things, then sit on your objective in the centre. Still rather worrying for tournament play where you're likely to play 2 of each mission, which means you can only win 4 out of 6 games. Ah yes, I was talking about Tau Battlesuits and Stealth Suits wasn't I? Got distracted with my bitter loss for a moment there. Well, we worked out that for 180pts you can have 6 Tau Stealth Suits. That's 6 wounds, all with 3+ saves and 6 Burst Cannons which put out a total of 18 shots at Strength 5. Plus the stealth field, which everyone seems to spot anyway...although you do get Infiltrators and Outflank. Or, for 185pts you can have 3 Tau Battlesuits armed with Burst Cannon, Missile Pod and Multitracker, plus a team leader upgrade with 2 Sheild Drones. That's 8 wounds, all with 3+ saves, 4+ invulnerable drone saves and 3 Burst Cannons, plus 3 Missile Pods for a total of 15 shots, but 6 of those are at range 36", Strength 7 and AP4. They take up less room on the board and they're not bad in close combat either with Strength 5. I think I may drop one of my usual 6 strong Tau Stealth Suit teams in favour of some more Tau Battlesuits. That's an interesting thought, but I have some counter points. If you start to lose crisis suits the effectiveness of the unit goes down a lot faster. With less models in the unit (only one, but still) you're going to be taking morale tests sooner than with the 6 man stealth unit. Crisis suits are taller than stealth suits, so while the unit has a smaller lateral footprint than the stealths, it is taller and can be spotted over things. A less tangible consideration is that people perceive crisis suits to be more of a threat - at least in my experience. Depending on how you play that could be a blessing or a curse. Just some things to think about, but I'm intrigued by your idea. True, but your have shield drones to bite bullets. Toughness 4 means you'll take less casualties than Toughness 3. So it balances. Generally terrain seems to hide everything or nothing at all. Don't forget that you don't have to be 50% obscured from true line of sight to gain a cover save if you're infantry. That only applies to vehicles and monstrous creatures. You can simply be behind a terrain feature to get the save. Give both units a try and see what works for you. The stealth suits have infiltrate, which let my wipe out 6 Tyranid warriors in a single turn (with some markerlight help), so that's something to consider in favour of stealth suits. For me, the outflanking is worth it. Bringing on a squad of six Stealthsuit with Marker Drones in tow is much better, to me and my playstyle at least, then running up or deep striking a Crisis Team. Plus, taking Firestorms somewhat saturates their firepower: either the Burst Cannon shots are wasted against high Toughness models or the Missile Pods are overkill. Firestorms are potentially the best Crisis teams in Fifth Edition, but I wouldn't completely replace them with Stealthsuits or vice versa. Both have their uses, especially against Tyranids. I usually like the extra shots, but that's just me. OK, even tho I have been playing Tau for a while (Normally play Orks), what are "Firestorms"? Tau Battlesuits with burst cannon and missile pods. OK, thanks, didn't really know that certain suits had names. Altho, I have 6 stealth suits, I rarely ever use them. I prefer crisis suits, as they at least have some AP2 weapons plus they shoot further than 18". I've got a unit of 6 stealthsuits with Team Leader and markerlight (yay! relentless special rule). 195 points is only worth it sometimes. They are great at harassing basic infantry that only move 6 inches a turn (as opposed to fleet, bikes or jump pack troops). To be honest however, they are slated for removal from the army. I'd only bring them against Marines (weird right? ap5-works though), maybe guard, in a pinch orks (but they some fleet on one turn per game so...) My Tau battlesuits with twin-linked missile pods tend to perform better and are about the same price when you've given them shield drones. Just thought I'd pitch in having started running stealths recently myself. I usually infiltrate them either to harass the vanguard of opposition troops or to reinforce my own lines if needed. Occassionally they have been very effecive especially against genestealers and, bizarrely, SMs. However their success has always been markerlight-assisted (pathfinders). I don't know about you but I think they're a very overpriced unit for T3 and 1 wound. Adding leader, drone controller and 2 marker drones adds a ridiculous 70 points to a 180 point unit. I think this would make it an effective unit but 250 points?! That's crazy considering how fast they melt away if spotted or in CC. My main problem though is the 18 inch range. Fast assaulters laugh at this. Plus as someone earlier said, the stealth field don't work very often if you want to be in burst cannon range. Its a bit of a shame I think, because the models are wonderful. I really do think they ought be more survivable than they are. I have a second unit unassembled but with hindsight I would have opted for more crisis suits instead. Why does everyone run 6 man stealth teams ... is ther a reason beyond you can? I generally run 5 man squads (as it requires the same number of casualties as a six man squad.) I then get a team leader with 5 gundrones (controllers shared) to boost them. In my XP stealth work well against some opponents (Nids, Orks, very well against Eldar) and less so against 'shooty armies' like Guard. The 5 man, 5 GD stealth team comes in at 205 pts and I'd usually reccomend infiltrate unless your opponent is holding a lot back, otherwise flanking is the way forwards. Stealth teams are anti-personnel anyhow, the fusion blasters just a waste of time. Combined with markerlights they're awesome torrent of fire troops. Against Nids, I'd be tempted to build some cheaper anti-horder troops combining double flamers and missile pod weaponry. Three double flamers would tear the heart out of a gaunt formation, combined with a farourable assault and you've won. Why do peeps use shield drones and marker drones? Markerdrones on XV suits maybe because they count as 'relentless', but I generally roll with gundrones as the cheapest 'ablative wounds' going and I4 attacks too. Plus you add the ability to pin. Hence you could have ganged up on the stealers - guaranteeing victory?!? As a newbie Tau player I read the codex, built my army, read the blogs and went forward to do battle for the greater good. Many lessons were learned in my crushing defeats against the IG and Bugs but one discussion in particular took me a bit by surprise - the role of the multi-tracker. MY interpretation of the Codex and the technology was that the multitracker allowed the battleuit to fire more than one weapon - at more than one target - so the pule rifle could shoot the closer Squad A and the missile launcher shoot the further away Squad B - the logic being that (like in any military targeting system) the battlesuit is capable of tracking and targeting multiple targets simultaneously (multi-tracker). Howeve it seems it only allows me to shoot both weapons at the same target - I don't think the codex is that explicit. Would be interested in confirming how you and your readers use the multi-tracker and where you think the flaw in my interpretation is? Read the entry for the Target Lock and the wording for the Multi Tracker becomes much clearer. Target lock - enables the model to target a seperate enemy unit to that engaged by the rest of the unit. OK so you would select this gizmo to provide you independance from the other models in the unit - e.g. a two man broadside unit could then choose to fire their railguns at two seperate targets and could not fire their SMS since they do not have a multitracker. Since a standard battlesuit can only select 3 weapon systems you have to choose between the target lock or the multi-tracker. Anyway the answer is you can only shoot at one unit even if you have a multitracker, it just allows you to use both weapons.